On May 26, 2005 Marvelous Marvin Hagler was invited to Argentina for the KO Drugs Program. Every year this Event helps to raise money for children, for the Hospital in Buenos Aires. In same week, before the Charity Event, Marvelous was invited to a Boxing Show organized by the WBA Federation. The warm welcome in the Arena was unbelievable!!! Marvelous was called in the ring so the fans could see the Champ, but.........unexpectedly the WBA Vice President brought the Carlos Monzon Super Belt into the ring, and honored the Marvelous One as the Best Middleweight Fighter Ever. He is also the only one that was close to breaking the great Carlos Manzon's record. 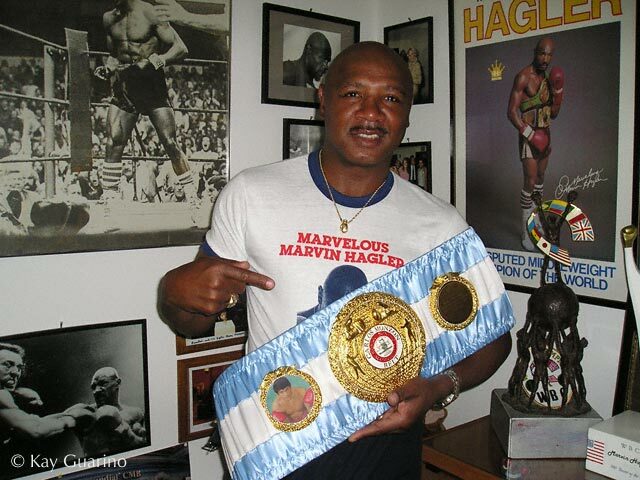 The picture shows Marvelous Marvin Hagler in his Office, holding the Carlos Monzon Super Belt. It is an honor for the Marvelous One, to receive such a beautiful gift and recognition after 18 years out of the Boxing game. He is very proud to be the only one in world to own this treasure. Marvelous Marvin Hagler would like to thank the WBA Federation, the Carlos Monzon Family, all the fans from Argentina, and all the fans around the world.